The 2nd Story Gallery will hold a fundraising exhibition and sale of original wrapping paper, gift boxes, and ornaments by artists, just in time for the holiday season. During the holiday season, many people look for a unique final touch for that perfect gift. This year, Calgarians will have the opportunity to obtain not only wrapping paper, but also original works of art by some of Calgary's leading artists. This is a fundraiser which will benefit all: The public who get a top quality product, the artist who will receive a portion of the profit, and the gallery which relies on fundraisers like this to keep its doors open. The 2nd Story Gallery is happy to present "Human Actuality Week," an exhibition of new paintings and drawings by Calgary artist Dawn Trueman. The exhibition consists of a body of work made since Trueman snipped the umbilical cord of art school seven months ago. The show observes a quirkier side. About her first solo show, Trueman says, "Being essentially autobiographical, my work is personal, as I am what I know best." Her work is about relationships of people and things in the guise of myth. It is a way of thinking, or a logic of dreams. The work attempts to be an ongoing dialogue that requires the whole set of elements and relationships to complete a conceptial circle. Dawn Trueman studied Painting and Sculpture at the Alberta College of Art, where she graduated in 1986. Paintings by Brian Meehan are portraits and figurative work dealing with ambiguous gesture. Laura Millard's paintings deal with issues in traditional landscape and the enigmatic presence of the human element in the sublime. Brian Meehan is a Bachelor of Fine Art graduate from the Nova Scotia College of Art and Design. He currently lives and works in Calgary. Laura Millard graduated from the Nova Scotia College of Art and Design specializing in Painting. She currently lives and works in Calgary. The intent of "Performance Focus" is to provide a professional forum for young local performance artists to present performance work to a receptive audience. A recent upsurge of interest in this media has prompted 2nd Story to create such an event. There will be three works presented by four local artists on each of the two evenings. The works will be presented at 8:00 P.M. on each evening at Bruno's Night Gallery, 1209B-1 Street S.W. The curator of "Performance Focus," Marcella Bienvenue, is a nationally recognized performance artist and film-maker who has been involved in this type of work since 1975. The exhibition of performance art by local artists will also feature a panel discussion moderated by Marcella Bienvenue. Mark Dicey, Bart Habermiller, Dave Clarke, David Smith, Anna-Marie Larsen, Stephan Peterson, Colleen Kerr, Nelson Henricks. Leila Sujir, Vern Hume, Sandra Tivy, Colleen Kerr. The 2nd Story Gallery will be presenting Low Tech/High Tech, a curated group exhibition featuring Mike Milo, Michael Ziendler, Bart Habermiller, Carole Thorpe, John Mitchell, Beth Harmer, and Wright Simmonds, dealing with artists’ views of the roles and uses of technology. Technology is so often thought of as being incongruous to Art: and Art vs. Technology simplicity. There are, however, connections and interactions and rooms for discussion and interpretation. The idea(s) conveyed by ‘technology’ (and its derivative words, forms and meanings) provides diverse and fertile grounds for exploration. The framework not as a multi-media display, but as an indication of a developing vehicle and vocabulary. As artists and humanists they observe, narrate and animate; tapping the humor of cynicism, irreverence turning to challenge, their art and ideas applied to perceptively constructed scenarios. In this context, the polemics of ‘Low’ and ‘High’ become irrelevant, as the main technology at the artists’ disposal in the process of communication – a personal, intellectual, and creative expression and response. Bart Habermiller is a recent graduate of the Alberta College of Art. The artist has exhibited at the Off Centre Centres' "Rotation Project", Gulf Canada Square, and will be involved in a group exhibition at the Stride Gallery in June. David Clark is a media artist interested in experimental narrative form and the cinematic use of the internet. He has produced work for the internet, narrative films, and gallery installations. Recent works include large-scale interactive narrative works for the web: ’88 Constellations for Wittgenstein’, an experimental portrait of the philosopher Ludwig Wittgenstein, and ‘Sign After the X’, an encyclopedic work about the letter X (made in collaboration with Vancouver writer/artist Marina Roy and composer Graham Meisner). He received a MFA in Sculpture from the School of the Art Institute of Chicago and has also attended the Whitney Program and the Canadian Film Centre. He is also the director of Meanwhile, a non-linear film developed at the Canadian Film Center that won the interactive multimedia fiction award at the Cinema Tous Ecrans in Switzerland. He wrote and directed the feature film Maxwell’s Demon and many short films and videos. He is the Chair of Media Arts at NSCAD University in Halifax where he developed the film program and is a researcher at the Cineflux Research group that is looking at questions of how cinematic form is changing with new technologies. John Mitchell attended the Vancouver School of Art and Design, where he majored in design process and graduated with honors in 1972. He later attended the University of Dalhousie in Halifax to pursue graduate studies, majoring in sculpture drawing and design. Wright D.C. Simmonds is currently attending the Alberta College of Art as a third year Sculpture major. He was also educated at the University of Alberta and Grant MacEwan Community College. Carole A. thorpe is educated at the University of New Brunswick (Fredericton), Southern Alberta Institute of Technology (Calgary), Concordia University (Montreal), and The Alberta College of Art (Calgary), where she received a diploma in printmaking. She has actively exhibited since 1981, and is also a published poet and author. The 2nd Story Gallery is pleased to present “Chimera”, an exhibition of works by Calgary artist Shelley Wilson. The pieces combine cast mask forms with traditional painting media. “Chimera” is conceived as a means to explore the concepts inherent in masks as instruments for the purpose of revelation and transformation of ones psychic identity. The individual themes of work are derived from the artists dream experiences and personal imaginings. Shelley Wilson is a native Calgarian and graduate of the Alberta College of Art, 1986, with a major in painting. 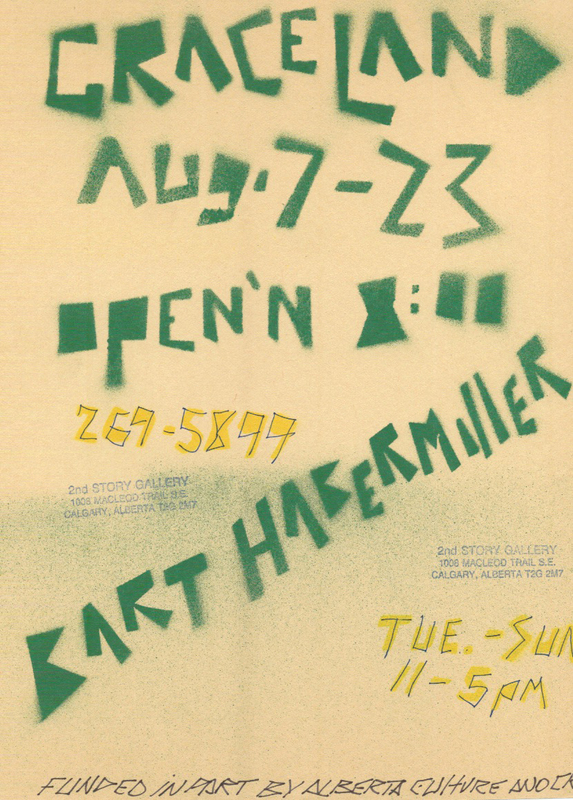 Second Story Gallery is pleased to present an exhibition of recent sculptures by Calgary artist Bart Habermiller. The sculptures on exhibition are the first body of work to have been produced at the artist's new studio location at the Calgary Demolition Compary. The two acre junkyard, popularly referred to as "Graceland", constitutes the artist's palette. The work involves an eclectic process of disassembling and reassembling discarded consumer products available at this location. The 2nd Story Gallery is pleased to present an exhibition of multi-media painted works by artist David Clark. 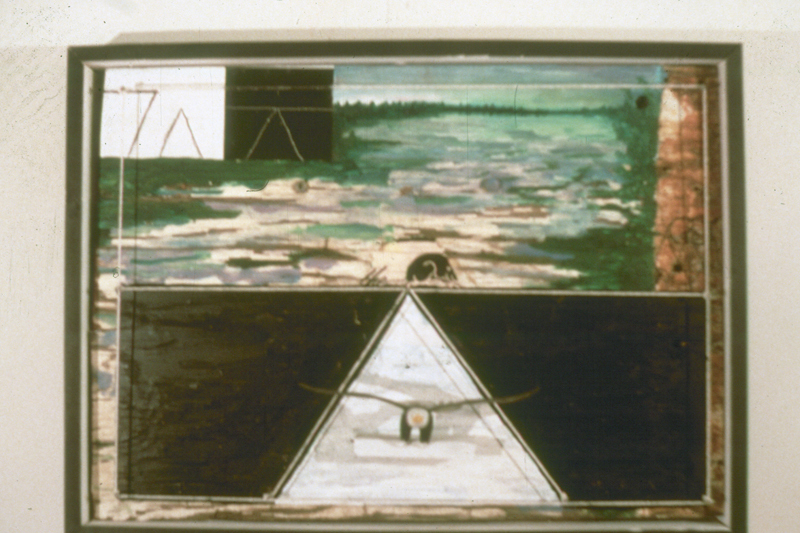 Using wood, paint, photography, plastic toys, and other materials Clark’s work encodes personal and archetypical symbols to examine the structures of perception.